Set based on the classic “Five Characters in Search of an Exit” episode. Each numbered package displays the five characters in their memorable ladder formation. Entertainment Earth Convention Exclusive! What do five seemingly random people have in common? In The Twilight Zone, no one can know for sure! 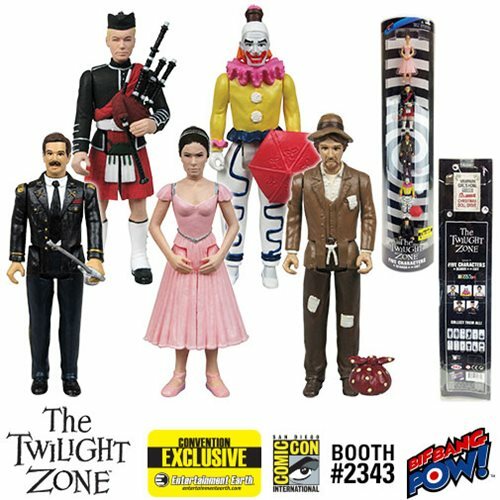 Now collectors can own the toys that don’t know they are toys with The Twilight Zone Five Characters in Search of an Exit 3 3/4 Action Figures In Color - Convention Exclusive set made exclusively by Bif Bang Pow!. All figures feature 5 points of articulation, including: neck, shoulders and hips. As an added bonus, the figures come packaged in a special stacked ladder formation inspired by the well-known scene from the episode! At only 672 sets, this individually numbered limited edition may disappear to another dimension soon. Ages 14 and up.